When we created Winter Wonderland at Phillips Place we did so with the intent to deliver a special environment by uniquely accentuating the holiday season. Partnering with a number of causes, including Toys for Tots and Share the Warmth, we were able to connect with the community by delivering thousands of toys and dollars — spreading the holiday cheer to those in need. These efforts were recognized and honored by the International Council of Shopping Centers for the work and creativity that we put into the event, and were overjoyed with the feedback we got from our neighbors and attendees. However, we were recently made aware of another momentous occasion that took place — one that serves as an important reminder as to why we place such an importance on community. 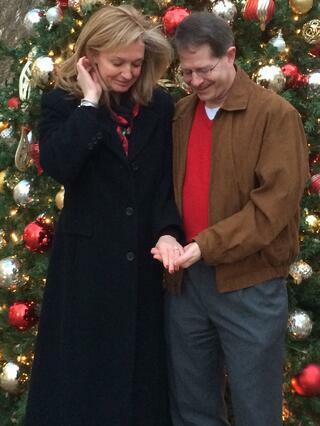 As the snow fell from the sky, the lights danced on the side of the Hampton, and 150 gallons of hot chocolate were served from Dean & Deluca, David Wensil was crouching down on one knee in front of Sherri Johnston. "Phillips Place was the obvious choice for us to be engaged," David began. "It is difficult to explain the full significance. However, it is the place where our relationship truly began. It's the place where we experienced many long walks getting to know each other, and enjoyed wonderful meals together. It's the place where we experienced the joy of our first Christmas together with the lights and the Phillips Place Christmas tree. 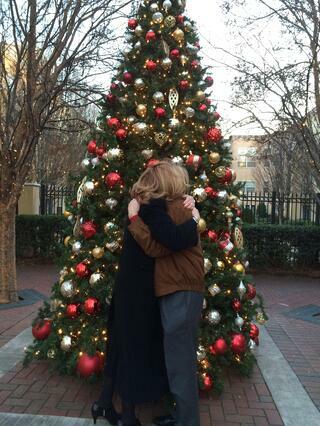 I couldn't think of a better place for our engagement than 'our' Christmas tree at Phillips Place." "In the beginning of our relationship we would get coffee and sit at the little wrought-iron tables and chairs in the courtyard area across from P.F. Chang's," said Sherri. "This is where we got to know each other. We would also meet for breakfast at Dean & Deluca on Saturdays in the warmer months. Some of our best Friday nights consisted of takeout from P.F. Chang's for David, and Wolfgang Puck's for me while watching reruns of Mad Men at my apartment." Phillips Place wasn't only an ideal location for them to craft their beginnings. In fact, it had been planting some seeds for their future together for some time. "On our many walks we would sometimes go into Restoration Hardware and sit on a certain couch they had," Sherri continued. "We would talk about how nice it would be to have in a house, but I believe we both were thinking about how nice it would be to have in our first house together. I'm fairly certain that couch just might find a home with us yet! I feel the same way about Granville. The items and colors in that store are beautiful, and the art is stunning. Hopefully we can use inspiration from there to furnish our first home together. Not to mention I also have an eye on a beautiful pair of shoes from Coplon's for the wedding!" "The special place for us has been that lovely Christmas tree that sits atop the platform during the holiday season, in the same space as the iron tables and chairs. 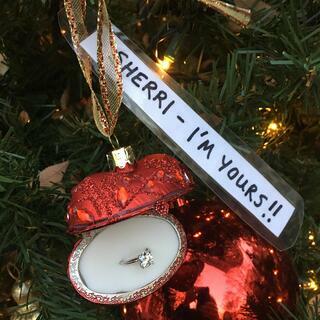 Last year — our first Christmas together — we went to see it frequently and it played a very central role in the amazingly special way David proposed to me this year." "She is a blessing that I want to spend the rest of my life experiencing," said David. To David and Sherri, we wish you both the happiest of marriages. We are thrilled that Phillips Place could host such a happy series of events, and we look forward to you making new memories with us as the relationship grows!